How do you get from a show cancelled due to lackluster ratings and lack of audience interest to Journey’s End? The answer is obvious. Russell T. Davies. The man has his detractors. He certainly has his weaknesses. As a scripted piece of television, Journey’s End is far from perfect. It doesn’t even measure up to Davies’ best scripts of the season – Midnight and Turn Left. However, as an executive producer, Davies is a force to be reckoned with. 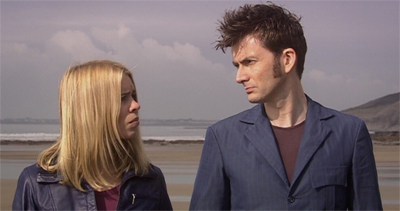 It’s hard to believe that something like Journey’s End could even be possible before Rose aired. Doctor Who ran the risk of being that failed telemovie starring Paul McGann and Eric Roberts. Even when Davies managed to secure the support to bring the show back to television, there was no guarantee of success. 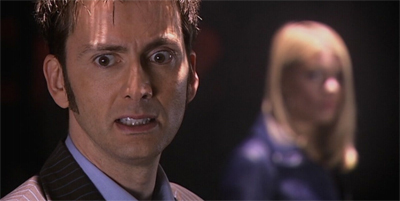 David Tennant has remarked on the surreal experience of being invited to watch Rose and Dalek before the show aired, and being offered the lead in a series that could easily fall flat on its face. He could easily have been the thirty-five-second Doctor. “But I would probably have got my own Big Finish series out of it,” he quipped. 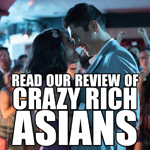 Instead, the show became a massive critical and commercial success. 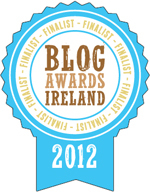 It has bounded from strength-to-strength. As Journey’s End takes great joy in reminding the viewer, this isn’t just a revival – it’s a franchise with two very different satellite spin-offs. Even after Davies departed from his executive producer role, the show has continued to expand. Steven Moffat and Matt Smith really helped the show to break out Stateside. Even Davies managed to take the spin-off Torchwood to the United States. Journey’s End is the season finalé to the last full season from Davies and Tennant, the two public faces of this rejuvenation. As such, it’s a showcase for both. As I noted in the review of The Stolen Earth, this two-parter is really about bringing back everything that Davies has brought to the table. The casts from the spin-offs, the supporting characters, the Daleks, even K-9! It’s a gigantic valentine to everything that Doctor Who is, including being big and bold and ridiculous and absurd. It even brings back the classic Daleks, not the rather serious reinvention introduced in the show’s first season. This is a “fully-fledged Dalek Empire at the height of its power.” And that means they are not afraid to be a little ridiculous. We get Daleks screaming in German! We get Daleks spinning around on the floor! We get the cast kicking and pushing them around as if they are silly props gliding on wheels rather than legitimately terrifying galactic conquerors. It’s telling that the Daleks’ master plan involves nothing less than “the destruction! of reality! 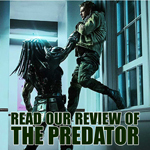 itself!” One level, this is Davies’ series finalé scale escalated to its logical conclusion. In The Parting of the Ways, the Daleks threatened the future. In Doomsday, the Daleks and the Cybermen threatened modern-day Earth. In The Last of the Time Lords, the Master had conquered mankind and was planning on taking over the cosmos. The only way to really top that involves a plan to destroy everything ever. Call for help, with a kiss? However, more than that, this means that the Daleks threaten the Doctor with nothing. With oblivion. With emptiness. With vacant space. 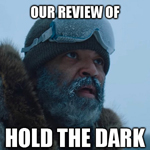 The threaten to destroy an entire universe populated with characters defined by their relationship to the Doctor – they plan to wipe out an entire fictional reality. They threaten the Doctor with nothing short of cancellation, the complete absence of a future, the end of everything that he has built up and connected. Journey’s End is really the crescendo of Davies’ run, and he succeeds by pitting the Doctor against the end of his entire universe – a gigantic threat that the Doctor has already faced and endured. The Doctor has survived cancellation. It goes without saying that he can handle the Daleks. While things look bleak here, there’s never any suggestion that the Daleks have a chance of succeeding in this outrageous plan of theirs. Unlike the Master, who took over the world and the show, or the Dalek Emperor who force the Ninth Doctor to admit defeat, Davros and the Daleks mount a credible attack, but they never come close to defeating the Doctor or any of his companions. They shoot Jack, the immortal companion – but he escapes unscathed. Jackie, Mickey and Sarah Jane are able to infiltrate the Crucible without any real trouble. 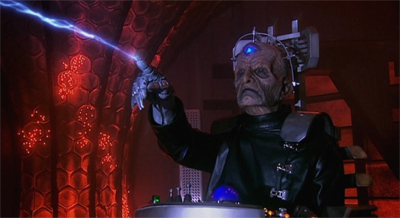 When Davros manages to shoot and hit both the not!Ninth Doctor and Donna, he fails to kill either. This is mirrored in the criticisms that Davros lays at the Doctor’s feet. Davros and the Tenth Doctor have the same sort of wordy exchange that the Dalek Emperor had with the Ninth Doctor through The Parting of the Ways. Both villains accuse the Doctor of being weak and flawed, and hypocritical. Both ask him to consider the consequences of his actions. Both lay very serious accusations at the feet of the Doctor. However, The Parting of the Ways suggested that some of these criticisms were fair and reasonable. The Doctor’s decision to surrender (“coward any day”) is presented as ambiguous. It’s a valid and important principled stand from the character, one which makes sense in light of his character arc and one which the show has validated in the past. On the other hand, it allows the Daleks to conquer and murder completely unchecked, exacting a far greater cost. 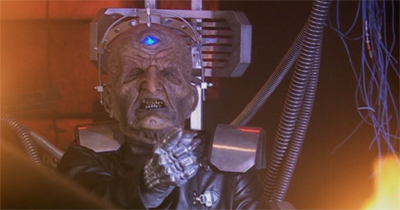 In contrast, Davros’ criticisms in Journey’s End wring a bit false. The fourth season has explored the idea of the Doctor as a flawed hero, climaxing with the brutal deconstruction of Midnight. However, Davies followed Midnight with Turn Left, a story which suggested that the Doctor might not always save everybody, but his presence is definitely a good thing. Without the Doctor, the world falls apart. Only mostly winning might sting, but it’s still something far more satisfying than completely losing. 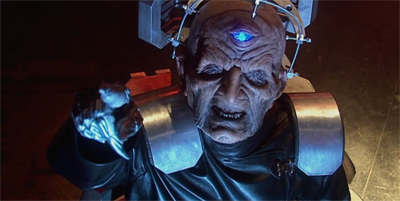 Davros launches some interesting philosophical attacks on the Tenth Doctor. “The man who abhors violence, never carrying a gun,” he mocks, obviously not quite remembering Resurrection of the Daleks. But who can blame him? “But this is the truth, Doctor. You take ordinary people. And you fashion them into weapons.” This sounds like a legitimate point, but it’s coloured slightly. Martha is apparently working inside U.N.I.T. to make them less trigger-happy. Jack is in the process of de-fanging Torchwood, producing a kinder and gentler secret spy organisation. Sarah Jane Smith has started a family. They make the world better, just as the Doctor tries to do. And, besides, it’s hard to begrudge any attempt to stop the destruction of reality itself. The Osterhagen Key might kill every living thing on Earth, but they will die anyway when the “reality bomb” activates. At least if Martha can destroy Earth, she breaks the Dalek engine. Similarly, the warp star would kill Sarah Jane, but it would allow her son to survive. These are not ideal outcomes – indeed, they mirror the efforts made by humanity in Turn Left to compensate for the lack of the Doctor – but they are better than the alternatives. However, while Davies does accept that the Doctor has a dark side, he makes it very clear that the Tenth Doctor is inherently heroic. When the not!Ninth Doctor comes running out of the TARDIS, it’s the Doctor who screams “no!” He seems quite aware that his counterpart is planning to commit genocide. After all, the not!Ninth Doctor is literally using the “genetic code” of the entire species against itself. He is launching an attack on the Dalek race at their genetic level. So Journey’s End projects all of the Doctor’s flaws and weaknesses and dark sides into the not!Ninth Doctor. He might be played by David Tennant, but it’s quite clear who this clone is meant to represent. The missing piece of the puzzle, the lost bit of Davies’ Doctor Who, the unnamed figure lurking just outside this merry little reunion party. Journey’s End sees Davies pulling back all sorts of elements from the show’s history, even stretching back to the first season. The Shadow Proclamation appears. The Slitheen are name-checked. The Emperor is referenced. And Christopher Eccleston remains absent, just as he shall remain absent from the fiftieth anniversary celebrations. Eccleston remains a controversial and divisive figure, falling out with the production and quitting the show after the first season. There’s an air of mystery and confusion around his time in the role. He only signed on for one season, but he admits that he was “open-minded” on the prospect of signing on again. 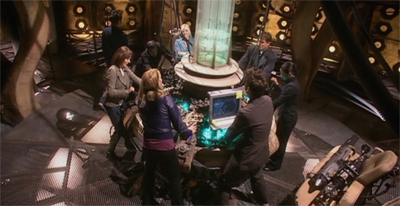 Touring to promote The Writer’s Tale, Davies suggested that the only reason Eccleston signed for a single year was because nobody knew the show would be a success. The reasons for Eccleston’s departure is unclear. Alan Davies has suggested that the hectic shooting schedule exhausted him. While Eccleston has shot down these rumours, it is worth noting that the production schedules for subsequent years was less hectic, with the introduction of “Doctor-lite” episodes the following season and even the split seasons of the Moffat era. Eccleston himself has made vague references to conflict behind the scenes and has recently championed his collaborations on the show with Joe Ahearne. Make of that what you will. Eccleston will not be returning for the fiftieth anniversary, despite Matt Smith’s interest in recruiting him. Watching the interviews with Eccleston leading up to the anniversary, it’s hard not to get a sense that he really doesn’t want to be drawn on the matter (“would I like to be involved?” he repeats to one interviewer, “if I told you that I’d have to shoot you…”) and it’s no surprise that recent interviews with the actor have clearly marked the anniversary as a topic that is not to be raised. And yet, despite his brief tenure and the sense that he did not part on the best of terms with the producers, Eccleston remains a crucial part of Doctor Who. While he wasn’t in the role when the show really took off, his presence did grant the show a certain amount of credibility and prestige. He is – to a certain group of fans – “the” Doctor. That group might be smaller than the corresponding groups for David Tennant or Matt Smith, but it still exists. Caan’s really come out of his shell! 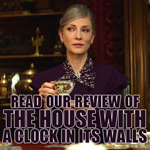 Eccleston’s divorce from the show is keenly felt, leaving a very obvious absence in places where the revived series tries to celebrate its own legacy and history. It’s no coincidence that Steven Moffat’s fiftieth anniversary involved bringing two separate non-Eccleston Ninth Doctors to the show, recruiting the almost-Doctor Richard E. Grant as a recurring guest star and creating a new Ninth Doctor to be played by John Hurt. So it’s no surprise that Eccleston is incorporated into Journey’s End, which really serves as a capstone to four years of the revived show. And, watching Journey’s End, it’s hard not to feel that that the show’s relationship with Eccleston is just as awkward as his relationship to it. The clone of the Doctor is very clearly intended to be a riff on Eccleston. He might be played by Tennant and wear the character’s trademark suit jacket, but he also rather pointedly wears one of Eccleston’s jumpers (because the leather jacket would be too obvious) and speaks with a more working class accent (which he apparently got from Donna). He charges at the Daleks holding a sci-fi space gun. The Tenth Doctor even acknowledges the comparison. “You were born in battle, full of blood and anger and revenge,” he tells his counterpart on the beach. “Remind you of someone? That’s me, when we first met. And you made me better. Now you can do the same for him.” The fact that the Doctor uses the word “born” indicates that he is talking about Eccleston’s version of the character and not the Paul McGann version or any of the pre-cancellation Doctors. He is talking about the first Doctor of this revival, not the last Doctor of the classic show. There are other points of comparison. This version of the Doctor gets to commit genocide in order to contain the Daleks. “Because with or without a Reality bomb,” he warns Donna, “this Dalek Empire’s big enough to slaughter the cosmos. They’ve got to be stopped.” This is the crime that stained the soul of the Ninth Doctor. It was something he never recovered from. So having the character play out that role once again makes it clear that this clone is an analogue for the Ninth Doctor, who will likely never appear on the show again outside of flashbacks. All this is fine, however, it feels like Davies is going out of his way to dismiss or belittle that version of the Doctor. He is stranded on a parallel world by the Doctor for the greater good. As he prepares to wipe out the Daleks, Donna pleads, “Just, just wait for the Doctor.” The not!Ninth Doctor asserts, “I am the Doctor.” The obvious implication is that he is not actually the Doctor. He’s merely a convenient place-holder. As far as Journey’s End is concerned, the Tenth Doctor represents a considerable improvement. He’s portrayed as a character who is very clearly of secondary importance to Rose. Rose fixed him; Rose made him better. Which is undoubtedly true, but Journey’s End treats it as a one-way process, as if this version of the character is nothing but a war criminal waiting to happen, who needs to be locked away for the good of the universe. It feels like a conscious effort to marginalise Eccleston’s contribution to the show, to reduce him to merely “that character who existed before David Tennant became the Doctor.” It’s the a bum note in this other celebratory two-parter. Like The End of Time, Part II, this episode builds a lot of weight around the concept that the Tenth Doctor is the Doctor. In The Parting of the Ways, the last episode to feature the Ninth Doctor, regeneration was described as “a little trick, it’s sort of a way of cheating death.” It was not death, merely change. The show itself accepted it quicker than Rose did. 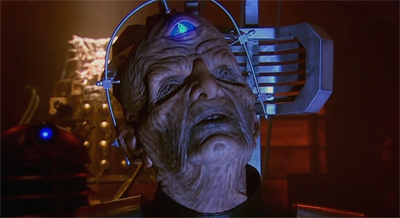 In The Stolen Earth, faced with the prospect of regeneration, the show repeatedly and consciously equates that process with death, something that would continue into the specials. “He’s dying and you know what happens next,” Jack tells Rose. 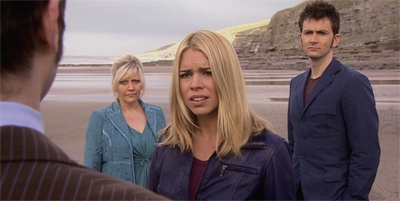 Rose immediately goes into mourning, “Oh, no… I came all this way…” It doesn’t matter that – if the process completes – the Doctor will still exist and will still be able to help Rose save the world. 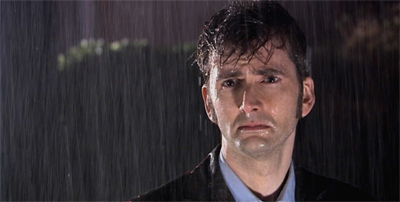 The show seems to suggest that the passing of the Tenth Doctor is the equivalent of the death of the Doctor. 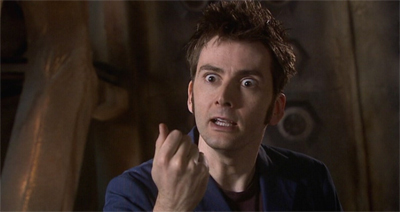 David Tennant’s character is the Doctor, accept no substitutes! It’s not the first time that regeneration has been explored as death, but it’s very disconcerting when coupled with Journey’s End‘s attitude towards Tennant’s direct predecessor. Of course, this sets up a nice character arc for the Tenth Doctor, as he desperately avoids changing, afraid of losing what he is right now. “Used the regeneration energy to heal myself, but soon as I was done, I didn’t need to change,” he explains. “I didn’t want to. Why would I? Look at me.” It’s quite clear that the Tenth Doctor is terrified of the change that comes with regeneration. The problem with this is that the show asks us to agree with him entirely – why would he want to change? I hope he never leaves! Even amid the celebratory atmosphere of Journey’s End, it does leave a strange taste in the audience’s mouth. And then there’s Rose. I really like Rose at certain points. She was a character who was hugely instrumental in the success of the revived series. I think she was the perfect companion for Christopher Eccleston’s Ninth Doctor, just as Catherine Tate’s Donna Noble was perfectly suited to David Tennant’s Tenth. I even quite like her appearance in Turn Left, where she serves as the ultimate example of how the Doctor is “the man who makes people better.” Empowered by her time with him, Rose is able to ascend to something truly spectacular, saving all of time and space. That’s a wonderful rebuke to any of Davros’ criticisms. However, The Stolen Earth and Journey’s End undermine that portrayal by revealing that she might be saving space and time, but she’s also using her ability to track down her ex-boyfriend. Davies very clearly has a fondness for Rose, and well he should – Rose is the most important part of that crucial first season that belongs entirely to him. Davies reinvented the Doctor, but he’s still the same character from the classic show. 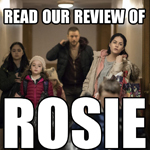 While Rose owes a massive debt to Ace, she feels like she could have innocently wandered from one of Davies’ other scripts into the show. Davies is very happy with his work, and he should be. However, Journey’s End has a lot of the same problems as Doomsday. It’s very hard to feel too sad for Rose when the universe concedes to give her absolutely everything she could have wanted while accepting that Billie Piper can’t be a regular on the show forever. She got a better and more satisfying life, a reunited family and deeper understanding of the universe. And yet she spends most of The Stolen Earth and Journey’s End demanding that the universe give her more. 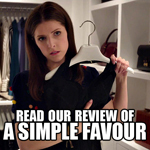 It seems like the Ninth Doctor’s critique of her in Father’s Day was correct. She is selfish and entitled. 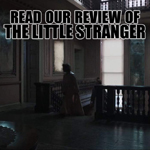 It’s hard to read the scene. Did Davies intend it as a genuine and emotional farewell? Given how earnest the whole “does it need saying?” bit is, it feels like Davies is being entirely earnest here. At the same time, as the Doctor ships Rose back to Pete’s World with a brand spanking new clone to keep her company, it seems like he’s trying to deal with a stalker. He’s filing Rose and the not!Ninth Doctor away together somewhere where they won’t bother him, treating Rose in the way you’d imagine that a Time Lord treats a psychotic stalker ex-partner. This obviously doesn’t fit with the version of the Doctor that was heart-broken in Doomsday and for most of the third season, but it feels like an uncomfortable piece of relationship subtext to that scene. “It’s not you, it’s my clone.” It’s obviously nowhere near as bad as the abusive relationship subtext that existed between the Sixth Doctor and Peri, but it feels like it does both characters involved a massive disservice. Still, at least there’s Donna. Watching Davies’ finalés, I’ve found that the effectiveness of his default convenient plot resolution is directly proportional to the emotional cost of that resolution to the characters. While he’ll vaguely foreshadow the resolution before he goes all-in on it, Davies does tend to pull the resolutions for his high-stakes episodes out of thin air. Here, for example, the Doctor and Donna defeat the Daleks by twisting some dials to some epic music. The end of The Part of the Ways is just as contrived and convenient as the climax of The Last of the Time Lords, but the former works because the characters pay a massive personal price for the victory. The lead character departs the show, the Ninth Doctor passes into history. 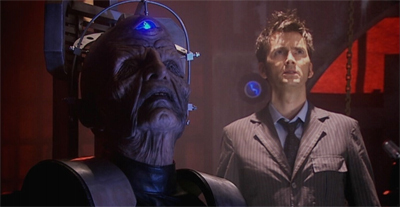 In contrast, The Last of the Time Lords sees the Doctor crying over the corpse of a genocidal mad man. Perhaps that’s why Doomsday‘s resolution always grated, because the only price was the inevitable companion departure to a world perfectly tailored to her every need. This extends beyond Doctor Who. In Children of Earth, the ultimate resolution to the alien plot line is a bunch of techno-babble, but it’s techno-babble that comes at a huge dramatic cost to the main characters. Davies is a writer who is primarily driven by character, and so it makes sense that the real consequences to his epic finalés tend to be measured in terms of character. So while the resolution to Journey’s End is just as trite as that of The Last of the Time Lords, it’s easier to forgive because it comes at a massive cost. That cost is Donna. I’ll admit to a slight bias here. Donna is probably my favourite companion in the history of the show, and a lot of that is down to the chemistry between David Tennant and Catherine Tate. The pair have wonderful comic timing, and their styles compliment each other. The Tenth Doctor is such a bombastic screen presence that he needs a companion who will hold ground against him. Davies and Tate craft a companion who doesn’t take any nonsense from the Doctor, and that’s refreshing. The only other Doctor-companion relationship that works like that is the dynamic between Tom Baker’s Doctor and Lalla Ward’s Romana. So wiping Donna’s memory, and destroying her as a character, is the most beautifully cruel price that Davies could ever exact for the convenient plot resolution. He effectively wipes out all her growth and development through The Runaway Bride and the entire fourth season. 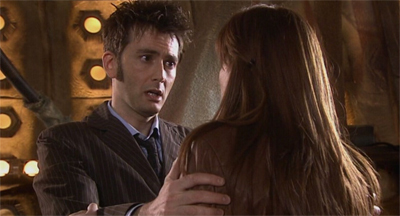 He sets her back to how she might have been if she never met the Doctor in the first place. 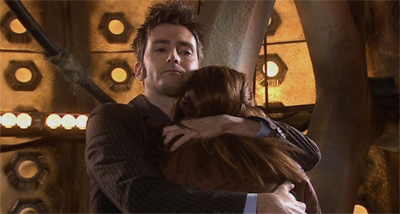 While Rose, Martha and Jack are all enriched by their experiences with the Doctor, Donna will retain none of that. Interestingly, Davies didn’t hit the big “reset” button on the events of this two-parter, he opted to hit “reset” on an entire character. And it is heart-breaking. Davies makes the case that the Doctor is an empowering force, a man who helps people develop their potential and become all that they could ever be. That’s the real benefit of travelling in the TARDIS. So taking that from Donna is an absolutely devastating blow, and gives Journey’s Ends a much-needed dramatic core. To quote the Doctor from Silence in the Library, it gives the episode “size” – more than Dalek invasions or the destruction of reality itself. Davies’ stories always work better on a personal level, and Donna gives Journey’s End a decidedly personal level. It helps that Tate is phenomenal. Tate always had wonderful comedic timing, but she has also demonstrated considerable dramatic talents over the course of the fourth season. The quiet scene in the TARDIS after dropping Rose off is the most emotional sequence of the episode, as Donna starts to realise that she can’t keep the gift she’s been given. (Tennant is pretty great as well, playing quiet anguish superbly.) As it dawns on her, Donna begs, “No. Oh my god. I can’t go back. Don’t make me go back. Doctor, please, please don’t make me go back.” It’s a phenomenally powerful scene, and a brutal subversion of what Davies has always presented as the wonder of travelling with the Doctor. Of course, it’s hard not to read Donna’s farewell as a piece of reflection on the part of Davies himself. Donna is returned as a clean slate, returning to the most normal of lives. And yet the universe that she helped save remains. Given that Davies would soon be surrendering the show to Steven Moffat, it seems like a very personal resolution to the plot. Davies won’t be writing Doctor Who any longer. He will be nothing more than a passive observer of the Doctor’s adventures. However, he also made some incredibly lasting contributions to the show and the franchise that will live on long after his departure. The Stolen Earth and Journey’s End are messy. They are loud, overblown and bombastic. The plotting is rather lax in some places, and the resolution to the Dalek threat is somewhat trite. However, they’re also a capstone to Davies’ years of writing Doctor Who. They’re a gigantic celebration of the franchise, of everything it is and everything it has been. It’s very hard to begrudge it that. Indeed, it’s hard not to get caught up in the geekish pleasure of this gigantic crossover, which even finds room for K-9. At the same time, it’s a trick that only really works once. By the time that The End of Time comes around, there’s a sense that Davies has already had his big bombastic farewell tour of Doctor Who.